Laura Patricia Rose: 3rd Blogoversary Giveaway Number Two! 3rd Blogoversary Giveaway Number Two! A Mug AND Matilda- what more could a girl ask for to use whilst reading?! It so beautiful, for my morning coffee. Happy Blogerversary. This mug is so cute, it would be perfect for drinking tea while reading my books. Matilda is my favorite Road Dahl novel. 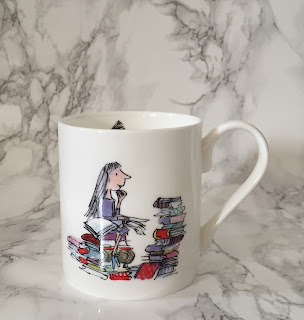 A cuppa and a book go hand in hand ... this is such a cute mug with an iconic bookish image, love it! Would love to own a Matilda themed cup, or anything Matilda related. It's so gorge! Happy Blogeversary! Being a booklover i love Matilda! first well done for you blog and happy bloavversary. I would love the mug because the film is superb. Would love to win for my niece, named Matilda after the character, one of our favourite Roald Dahl books. id love to win for my daughter who loves matilda ! My niece loves Matilda,I would like to win it for her. Happy 3rd blogoversary! I hope you had lots of cake & ice-cream! My niece loves reading and I know she would LOVE this Matilda mug too. Happy 3rd Blogoversary! 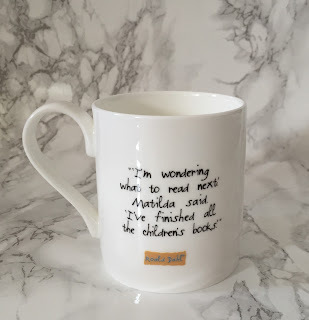 My little niece absolutely loves reading and this Matilda Mug would be lovely for her hot chocolate she loves to have while she reads.